It's that time of year. I have so much that I want to share with you, but I keep forgetting to take pictures of the stuff at school... hopefully soon I won't feel like I've fallen off the planet. I was looking through my old posts, and thought that maybe this reshare of technology would be helpful... Enjoy! It's that time again - linking up with Joanne over at Head Over Heels for Teaching to share the biggest motivation in my classroom these days. Everyday during silent reading and then again during workshop, there is a big silence as I announce whose turn it will be. The person chosen must have all their work completed to be able to take their turn. They must be on green or higher. 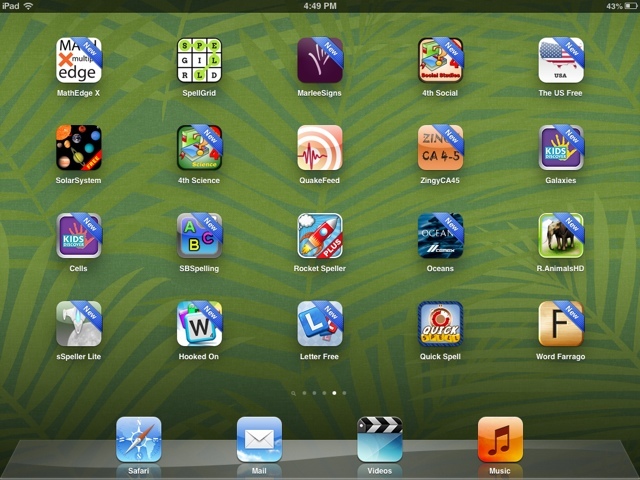 Of course the wireless in my classroom hasn't been working lately (at all this year), so the only thing they can really do on the ipad are the many FREE apps I have found and uploaded. The front page (not shown) is all the basic stuff that I use in the classroom - the timer, class dojo, camera, etc... Then it gets into the fun stuff. I started out putting them into folders with the different subjects, but a bunch of folders isn't exactly eye catching. The next page is mainly all math. I haven't bought any apps yet. It's all free stuff that my students are eating up. 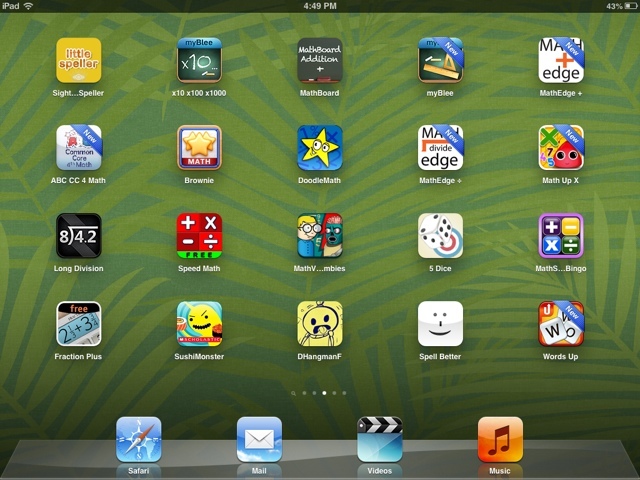 The kids know they are all educational apps - that they will only get educational stuff from me. They are loving the choices. 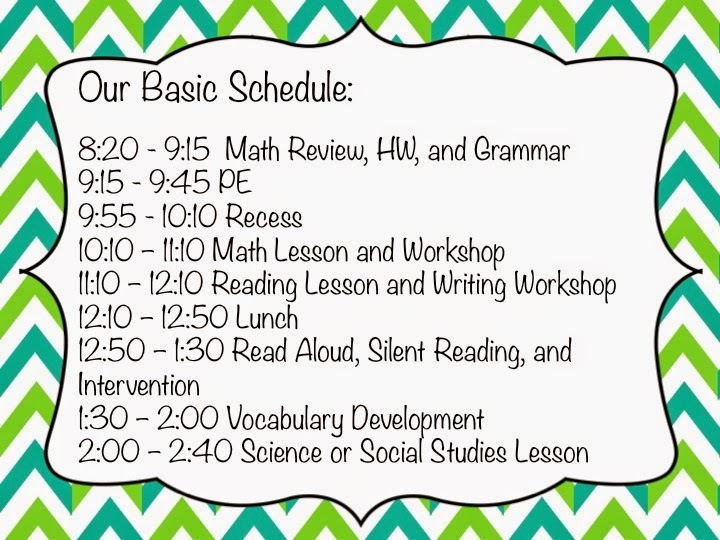 Right now it works out to being 1 or 2 students that get a chance during silent reading time (12-15 minutes), and then another 2-3 during workshop at the end of the day. So yes, it's taking more than a week to get through everyone, but we're making due (and the kids aren't whining). 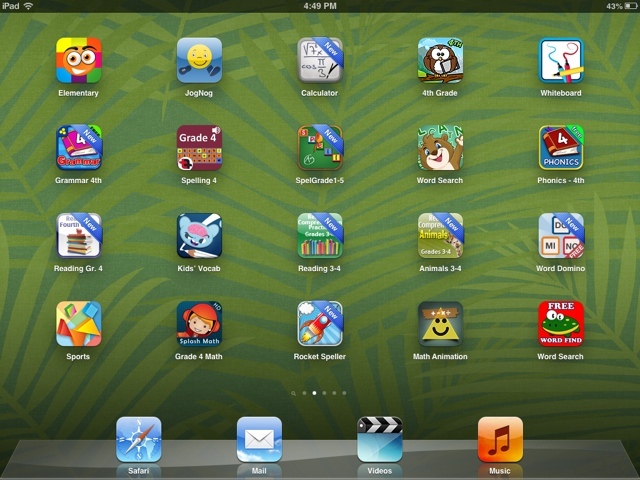 Between the Ipad (skills), the nowboard (whole class), the 9 mp3 players (listening centers), the Kindle Fire (free kid books), and the 2 microphones (fluency), the classroom is a busy technological place. :) Love it! 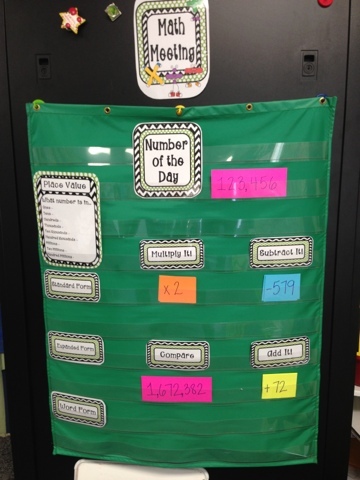 I wanted to pop on over to share a couple of activities that my students made last week. Usually the kids make a gigantic summer sandwich about their summers. This year we had to hit the pavement with everything we HAVE to do, so I decided to shorten up the summer story. A Summer to Tweet About came from Where the Wild Things Learn. There was an art project included, but we literally ran out of time - so the kids got to choose an owl dicut instead. That alone was motivation to keep going. Before they got to write the final draft, they had to Rainbow Edit their rough drafts, and show me for a mini conference. In Math, we took 30 minutes to create Math All About Me pages. 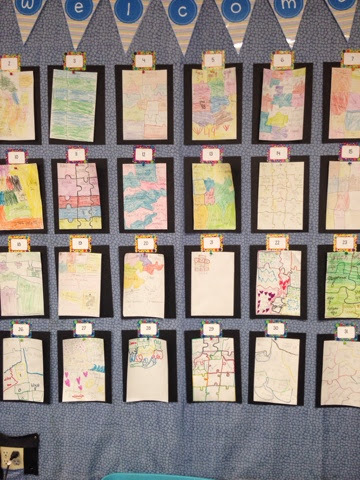 Each student received a piece of construction paper and divided their sheet into at least 10 sections. We brainstormed different things in our lives that have numbers - siblings, age, house number, phone number, known language, birthday, etc... and they filled it in. Fun activity that was interesting to see what they came up with. Remember about the BIG SALE tomorrow over on TPT. I'm so excited!! What?!? Another chance to shop over on TPT? Did you hear the news? Teachers Pay Teachers is having an ONE DAY ONLY SALE this coming Wednesday to pick up anything you may have forgotten about during the big sale a couple of weeks ago. Most sellers will be putting their stores at a 20% discount (myself included), and then TPT will take an additional 10% off with the code BOOST. 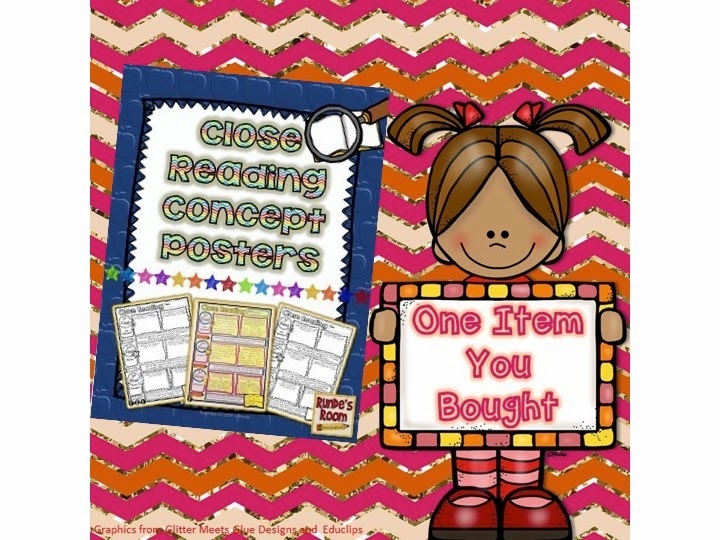 Last time, I picked up the Close Reading Concept Posters from Runde's Room. I love how these are set up and easy for kids to navigate by themselves. 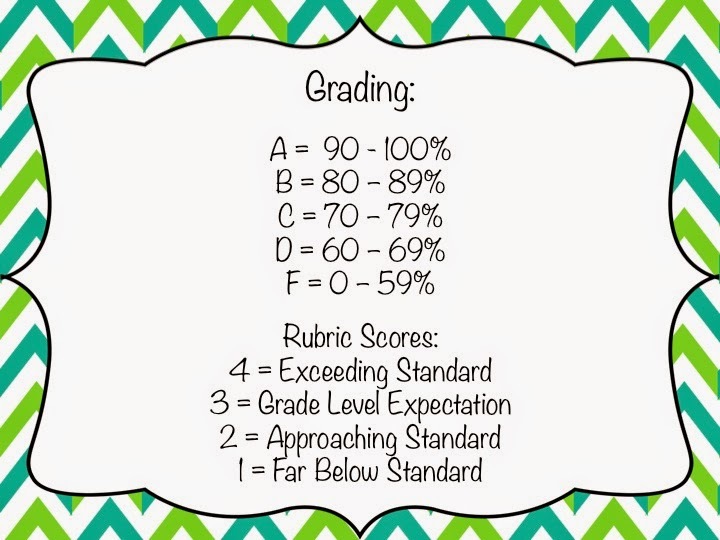 I can't wait to use them during my ELA rotations. 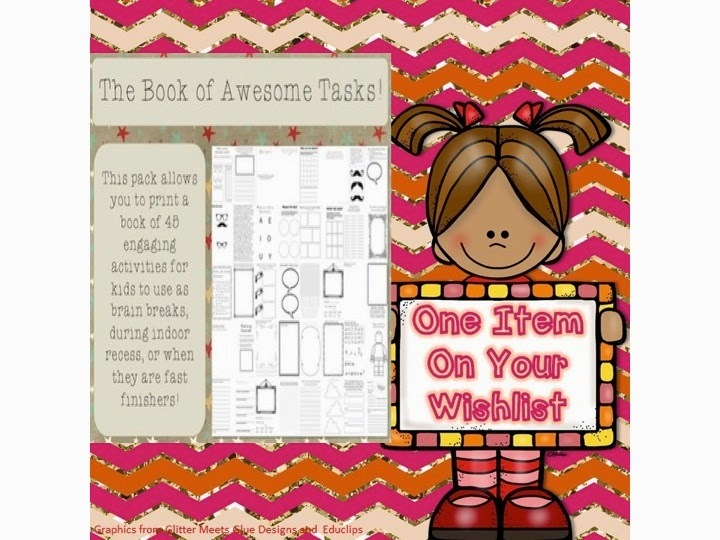 As for my own wish list, I would really like to pick up The Book of Awesome Tasks - brain breaks, indoor recess, or fast finishers from Nicholas Reitz. There are 48 different tasks included, and I would love to have something easy to go - especially that could be used during Friday PAT and rainy days. 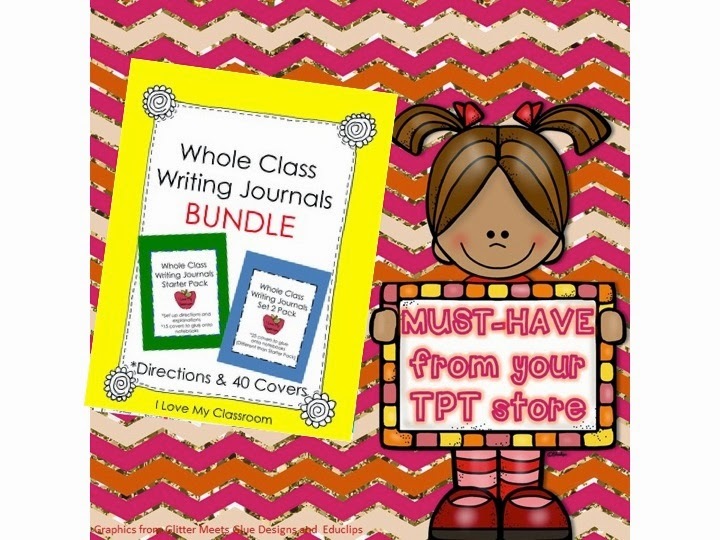 As for my own store - so many people have been picking up my Whole Class Writing Journal Bundle lately. 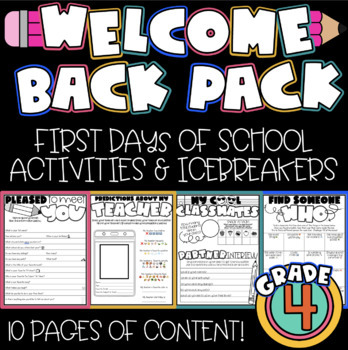 It contains directions and 40 covers that are just attached to a notebook - an easy print and glue task. 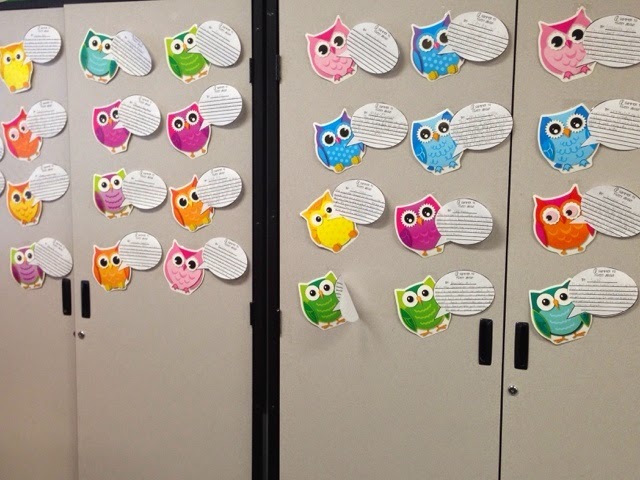 Students write in the books, writing about a specific topic, and then they can read each other's entries. I've found these notebooks help develop relationships in the classroom as the kids are learning about each other. In my own classroom the kids are able to write in them during Work on Writing time and when they finish their weekly writing assignments. It's a fast finisher tool that I LOVE. What's on your wish list? 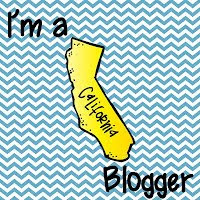 See other links over at Jivey's blog! This week was a blur. It was the first week of school - so it was long and extra full of all the beginning of year stuff. My preps were filled with writing receipts for agendas. My lunches were full of setting up for the next activity. My afternoons were filled with running around, getting things organized, and taking care of other responsibilities. My throat and legs are sore from going non stop over the past 5 days. :) I know you can relate! 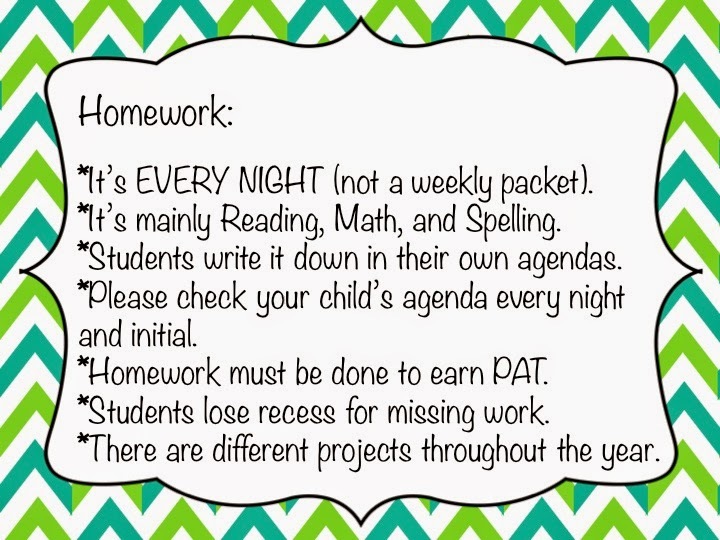 This week I had Back to School Night on Thursday. 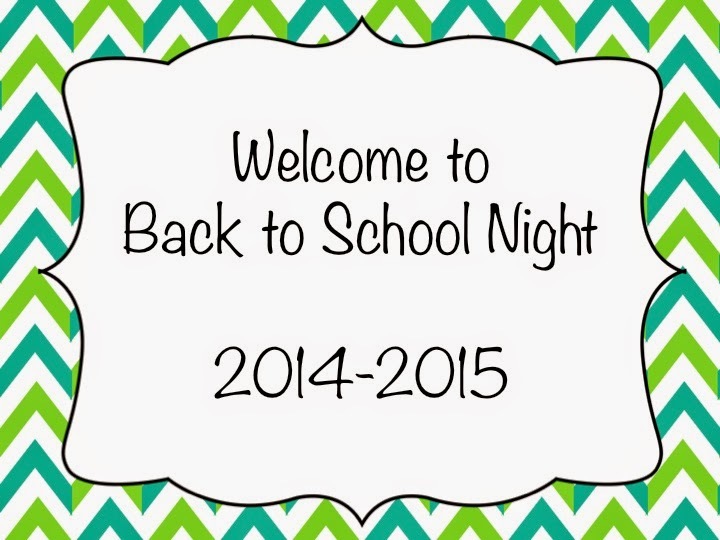 Back to School night is the Parent Night - we give 2 presentations, each about 25 minutes. It goes fast... and I talk really fast! 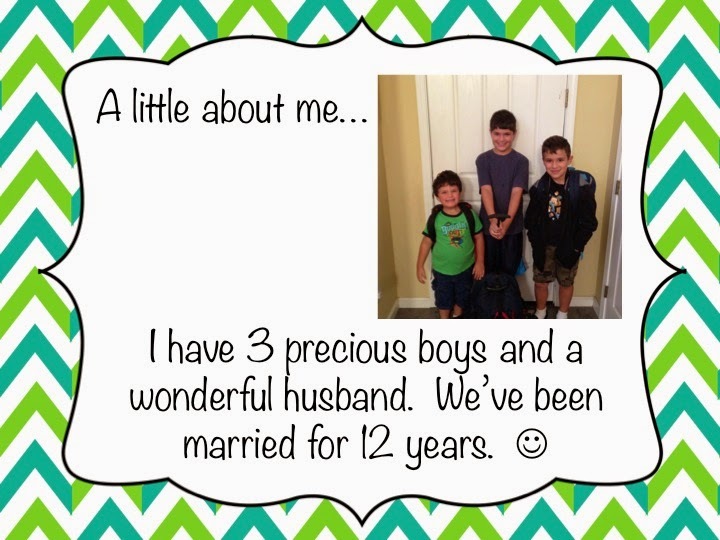 This year I added a picture of my boys first and foremost into my presentation - I want my families to know that I also have a family that is top priority. the old standards to the "new" ones. 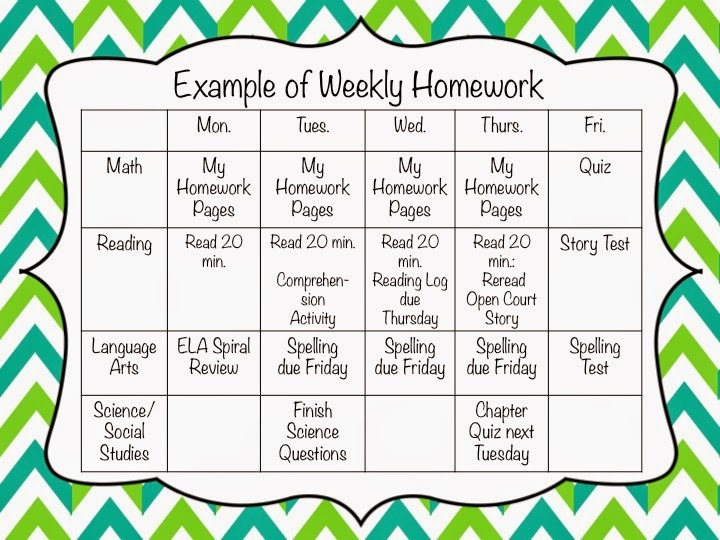 This year I gave a sample schedule of our weekly homework. As for their desks, I always load up them with my Back to School Packet (which just goes into depth about the things in the powerpoint) and these Parent Questions. 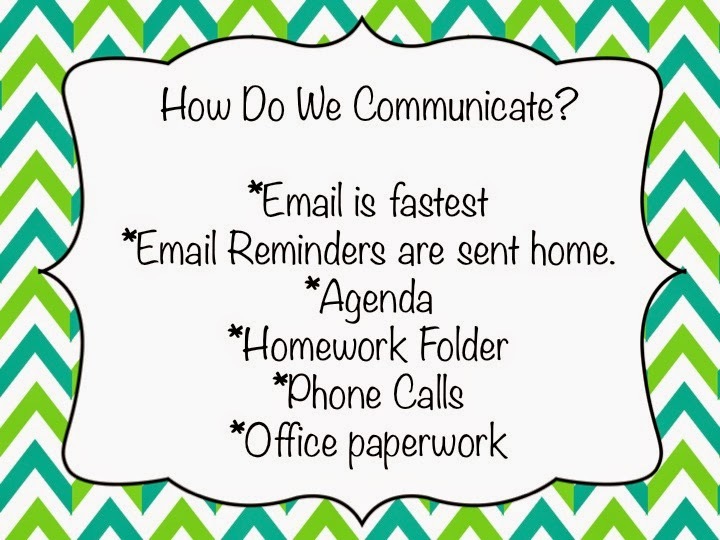 What kind of things do you add into your BTSN presentation? I don't know how I can look 21 and 56 at the same time. Most of the guesses yesterday had me in my thirties (which I am 36), but these two are throwing me off. I did cover up my grays last week, so maybe I do look younger than I am - but an additional 20 years older? I love these new kiddos! 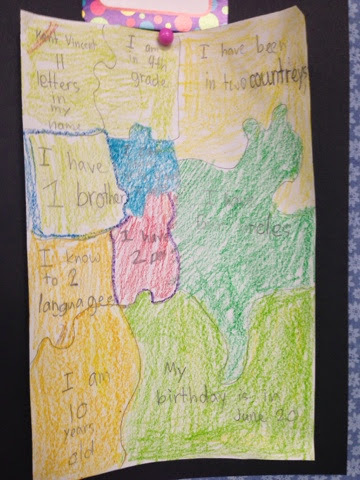 This paper came from the Welcome to 4th Grade packet by Katie Texas. LOVE this pack, grabbed it last summer. I don't give the kids the entire pack at one time. Yesterday they filled out the all about me page, and then this one where they had to make guesses about me & ask me questions. Those questions I answer during the next few days. The other activity pages are in another little packet that they will be working on the rest of this week when we have a free moment. Linking this up with Holly's Tried It Tuesday. 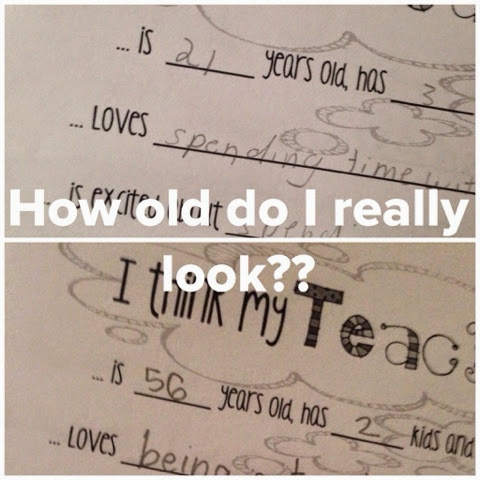 I have learned a thing or two over the past 15 years of teaching... I know that August and September will mean I have a hard time throwing decent meals together after a full day at school. Just on Mondays alone (staff meeting days), I tend to come home with a headache, and no amount of coaxing will get me in the kitchen to do serious cooking. So instead of cooking, I prep beforehand. Before school even starts I fill up my freezer with meals to keep my family of 5 nourished when I come home and just want to sleep. :) That's what I've "made" this past week - tons of future meals. 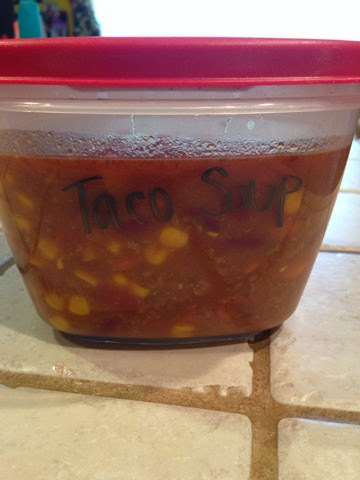 Taco Soup is a favorite. My dad's recipe makes double, so when I cook it up we automatically have 2 meals worth. Just brown some ground beef in a pot, add onions, then dump in a can of corn, pinto beans, kidney beans, stewed tomatoes, salsa, a package of Hidden Valley Ranch dry mix, a package of Taco Seasoning, and some chicken stock. It's so easy that even I can't mess it up! It simmers for at least an hour, then we serve it with cheddar cheese, tortilla chips, and sour cream. YUM! Can you tell we're having it for dinner tonight?! I LOVE using my crockpot too at least once a week during this stressful season. I get tons of recipe from the Six Sisters Stuff website and mix up the "sauce" that will be poured on top of the meat. 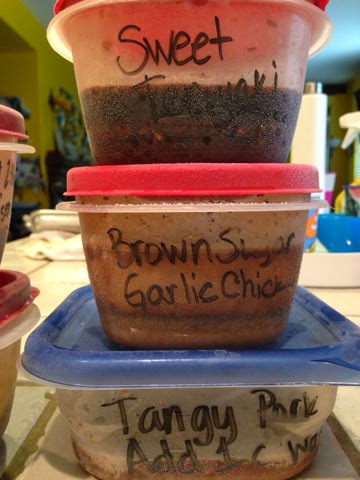 I stick it in my plastic containers, and store them in my freezer for one of those crazy mornings. In the morning I coat the crockpot with Pam, load in the frozen meat or chicken, and dump the frozen liquid sauce on top. Then after school it's just a matter of throwing some noodles in a pot, or making up Minute Rice or Instant Mashed Potatoes as a side dish. My family uses those steamable veggies that we stick in the microwave too. It's great for a fast dinner. and we're going to try out Sweet and Sour Chicken (I'm hoping it's good too). 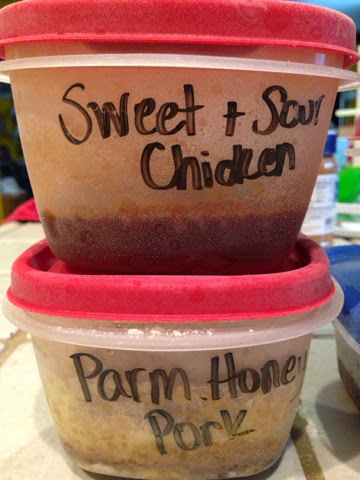 During the big stock up for school grocery trip, I grab quite a few packages of chicken and meat for the freezer, and stick them in single meal pouches so it's so easy to just grab when it's time. Linking this up with Tara's Monday Made It! What are your fast family friendly meals for those busy nights? I was planning for these next couple of weeks, and am feeling pretty thankful for my Math Pack and all the activities that are ready to go for this year. I decided to do a ONE DAY ONLY sale and drop the price to $35 ($17.80 off). I'm starting Math Workshop on Tuesday, and many of these task cards go automatically into the Hands On center. Why do I love task cards? I use them so many ways! *Whole Class Scoot Game - Everyone has a card on their desk and they have one minute to solve the problem before they "scoot" to a new desk. It's fun review! *Math Workshop Rotation - I stick a set of review cards (something we have already learned) into the bucket, when students are at that station they complete the cards and review skills. *Small Group Intervention - I pull kids over to work with them on skills we are learning right now. It gets us out of the math textbook. *Whole Class Lessons - I use the cards whole class as my examples for them to solve. *Morning Math - I use the cards in our Morning Math Meeting pocket chart for kids to solve. 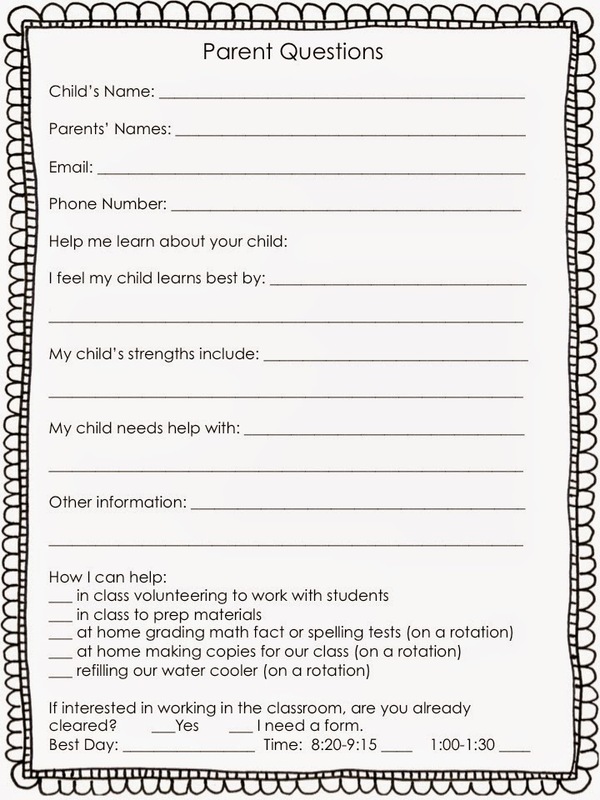 *One on one parent intervention - Struggling students work the problems with my parent helpers during intervention time. *Enrichment - I use them to give a sneak peek to kids that have already mastered our current topic. 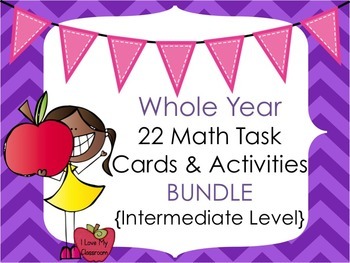 I really love task cards and I hope this deal helps you today! I want to link up my First Day Lesson Plans with Joanne for her Saturday Morning Motivation - Back to School Style! It's all about getting them motivated to learn. These plans were what I did last year, but since they worked so well, I'm basically keeping it the same. :) Hope you get some ideas! Tomorrow is the first day of school with the kids. 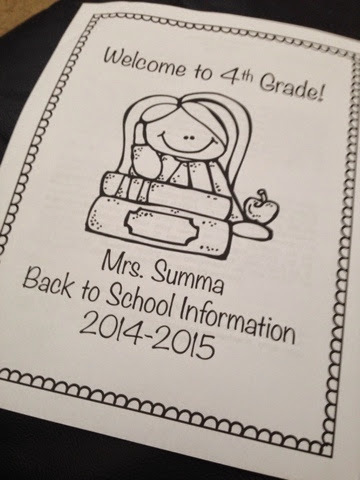 I'm excited, I'm nervous, I can't wait to meet my class! Last year I posted my typical first day agenda. It's too long to put all the details in my lesson plan book, so instead I make a list that I keep front and center. Most of the activities are the same, but I figured I would share it again in case you want to know what I'm planning on doing. 2. Kids say goodbye to parents and we walk inside. Kids wander around finding their desks, getting organized. On the board it says the directions - find seat, put lunch in lunch basket by door, work on All About Me papers. I give them about 10 minutes to work on those sheets - they may not be completely done by the time I start my spiel but they can finish later. 3. I introduce myself and we do a little KW chart about me - what do they know about me already, what do they want to know. I then tell them about me, about 4th grade, about our classroom. I pull out my Snapfish book from a few years ago and show them pictures of what to expect. 4. Then we take a little classroom tour. I tell them that this classroom is theirs too - not just mine, so I need them to know where things are. 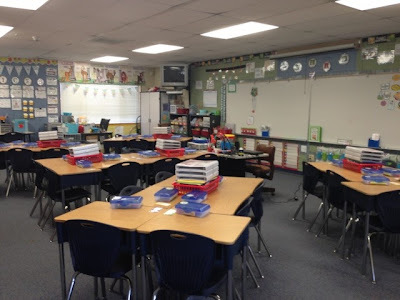 I start in one corner and work my way around the room, telling them about the different bulletin boards (a little preview of what we will work on), and the different areas - centers station, classroom library, writing area, etc. 5. 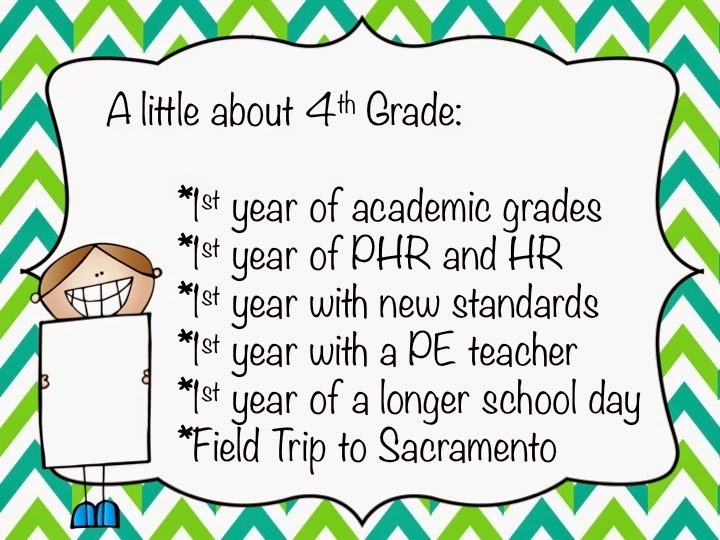 By then it's time for our PE prep, Welcome Assembly, and Recess - last year it took up 90 minutes of our day. 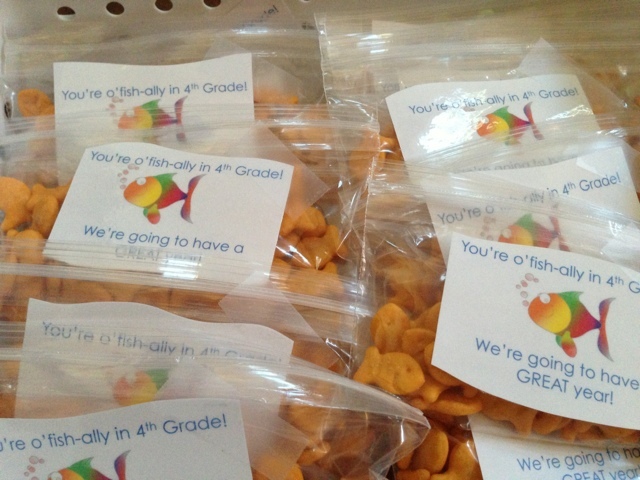 As we come inside to grab our snacks they will find their goldfish treat bag, "You're o'fish-ally in 4th grade!" on their desks. 6. After recess, we come back inside to the carpet and I'll do the read aloud "Did You Fill a Bucket Today?" I will show the example of the toothpaste being squeezed out and will ask for volunteers to try to stick it back inside the tube. 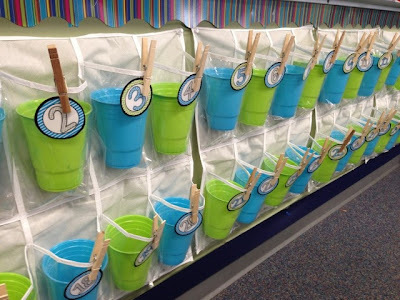 We will brainstorm how we can be bucket fillers in the classroom. We will also go over the purpose of the buckets and how that works with class compliments. 7. Then I'll introduce "Class?" "Yes!" 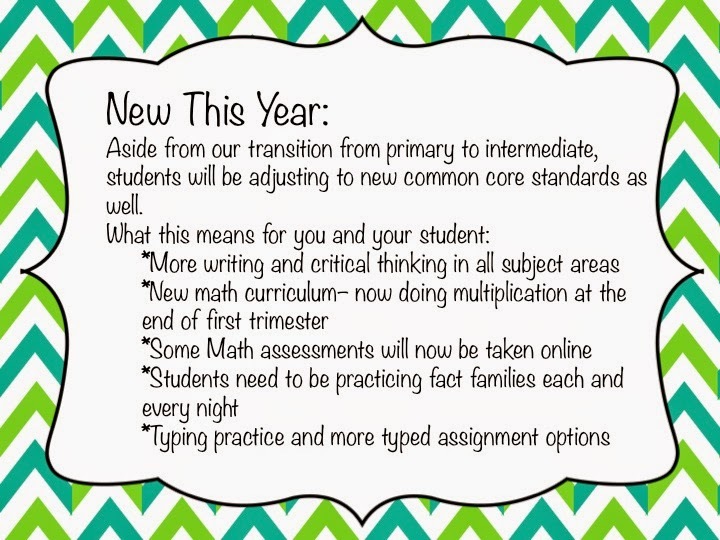 and we will practice over and over and over again as they transition back to their desks. 8. Next will come Rule Time. 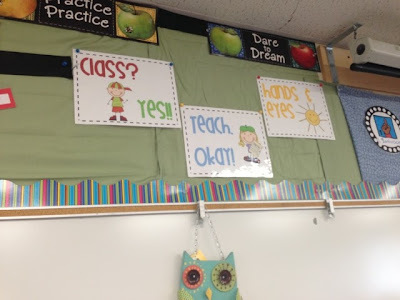 I have 3 main rules in my classroom. 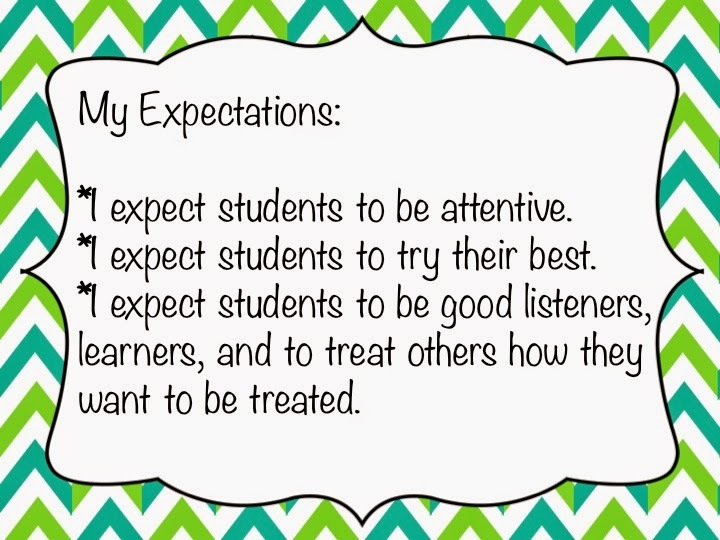 Respect yourself, Respect each other, Respect our school - we talk about what that means and brainstorm examples. I fill up the board with all the different ideas they come up with. 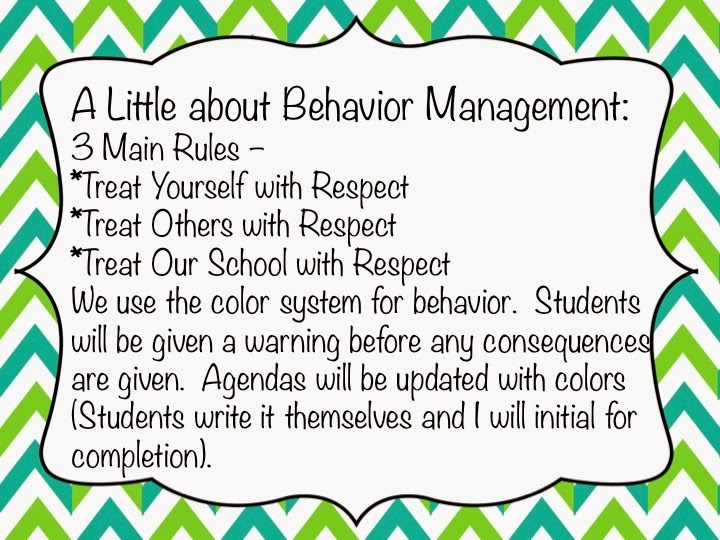 I go over the behavior chart - moving up and down on the colors. 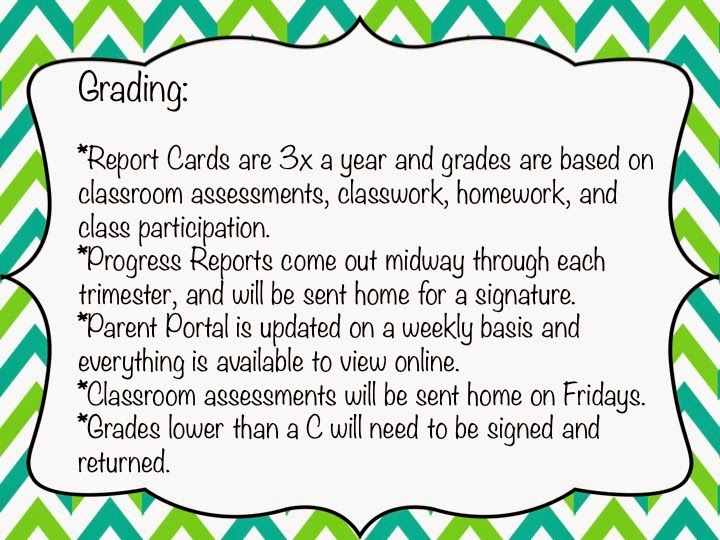 I'll tell them about the behavior beads that they can earn (little pony beads) for staying on green all week, and if they move up how they can earn an extra one. I'll show them the little containers that we will be collecting their beads in. Eventually those beads will form either a bracelet of necklace at the end of the year - we just aren't stringing them every single week. 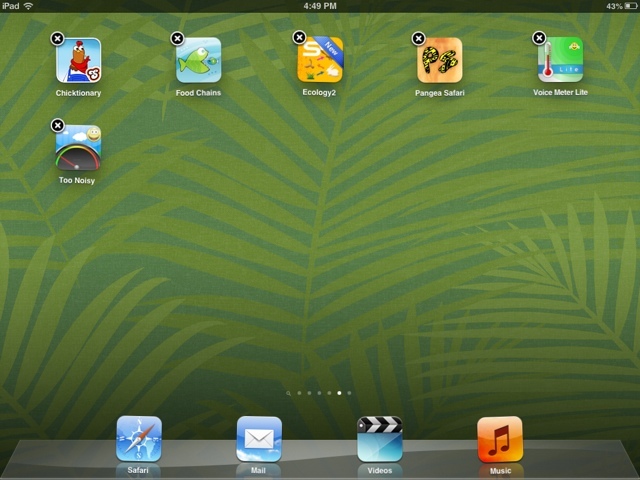 I will pass out an iPad paper and they will draw examples of the rules as apps. 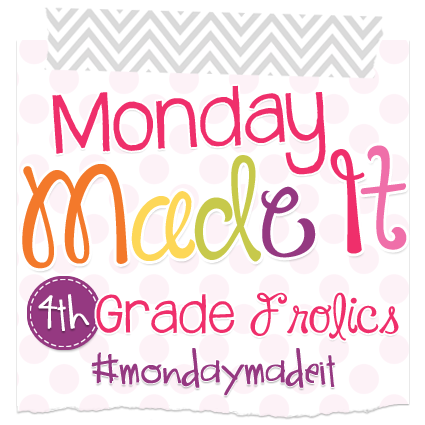 Math Meeting set is from 4th Grade Frolics. 9. After rules comes the first of many days of Math Meeting. We will head back to the carpet with their whiteboards and will work through the different activities together. I want them to get the routine of what to do at this time. Then we will go through it together. 9. Then it will be time for a little team work activity. We are going to "Save Fred". I got the idea last year from Fabulous 4th Grade Froggies - the kids basically are given a gummy worm, a gummy peach ring, one or two paperclips, and a plastic cup. Her story goes on to say that Fred can't swim, and his boat (the plastic cup) flipped over before he could get his life preserver (gummy peach ring) on. They aren't able to use their hands to help Fred, only the paper clip... having to work together as a team to get Fred safe and sound with the life preserver back in the boat. Last year my kids loved it! They even wanted that to be part of their memory book at the end of the year. 11. After lunch we don't have much time - basically only 30 minutes to finish up the day. When they walk in they will notice that all the books are out of the bookshelf on the desks (still in buckets). 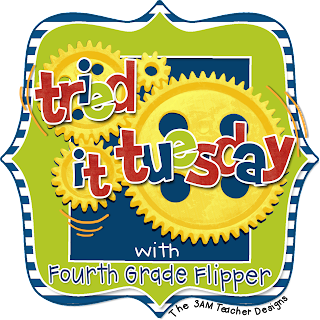 We will come over to the carpet and I will present the Daily 5 "I-PICK" mini lesson. How they need to choose books that have a purpose, interest, that they need to be able to comprehend the material, and know the words. They will all go shopping (given a set 10 minute time period) to choose 3 books to keep at their desks. We will talk about how when they are finished with something, that reading is their only option. 12. Then it's paperwork time - passing out homework folders, filling in their agendas, passing out all the papers from the office. Well - that's what's on the agenda for tomorrow. It's going to be a busy one, but from past experience it's going to be a great one too!